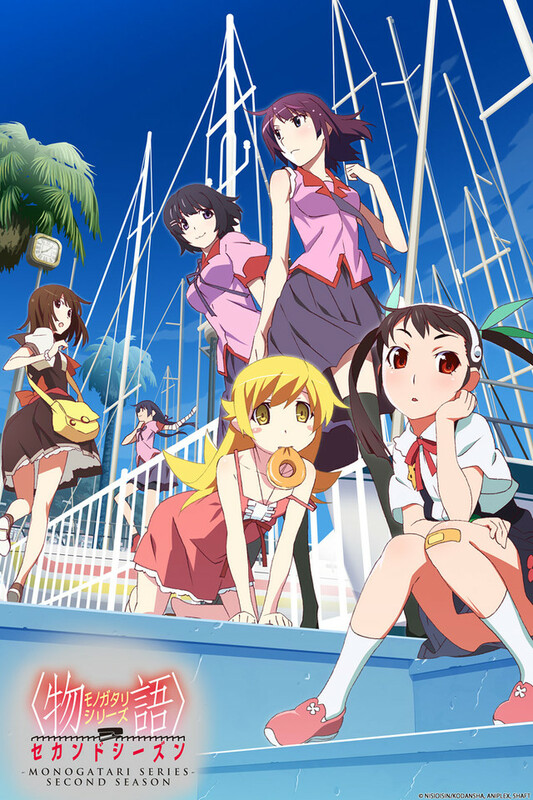 A Look at Monogatari: the second season. Once upon a time a writer by the name of Nisio Isin wrote a book, Bakemonogatari (its actually 2 books but whatever), It was filled with loads of uniquely characteristic characters, dialogue and word play (Japanese word play usually is tied to the Kanji more then anything.). I happened to be lucky enough to get my hands on a copy of it before it was animated and I can say that Nisio Isin is one of the most talented Japanese novelists in the Japanese light novel scene today . Enter Shaft, a company that is known for its avante-garde animation and story style, who decided to animate this book and its following sequels(and prequels). What followed is a series of very successful, yet polarizing anime, with some of the most absurd yet fantastically done episodes in a long time. We now come to "Monogatari: The Second Season", which is technically the 3rd season of the franchise (though the other work totals about 30 episodes). Monogatari is the first double season anime in the series with a grand total of 26 episodes in total making it a rather large undertaking. Before I give a total review to this anime, I'd like to speak about the very controversial Nisemonogatari briefly for the sake of people who are new to the franchise. In my opinion, Nisemonogatari was not a great anime despite being a well written book, there were a lot of out of place slow episodes with flights of fancy filled with liberties taken by the director. In the end it felt like it was trying too hard to appeal to certain aesthetics (artsy for the sake of being artsy) (Note: its not a horrible anime but its also not up to par with the other two in the series). Despite this, it is pretty much mandatory that not only Nisemonogatari be watched before Monogatari but also Bakemonogatari and Nekomonogatari (4 episode prequel OVA). Even with the summary episodes in Monogatari there will be a lot of good plot and story connections lost if you have no prior experience with the franchise. Monogatari is a very polarizing anime for a good reason. It is a dialogue heavy/character driven slowly paced drama/scifi/action/romance/mystery anime with a few penchants for perverse sequences that come off as fan service but fan service with purpose. Some will hate this style of story telling and others will love it. I am one of the latter. The dialogue and in particular, the word play, metaphors etc, are one of the main things that keep me coming back every week/year to see the next episode/read the next book. Veteran VA's play each of the characters from the main ones all the way to the peripheral; each expertly executing the dialogue sequences and fleshing out their respective characters with loads of life and uniqueness. I honestly don't think any one could play the "tsundere of tsundere" Senjogahara quite like Chiwa Saito for example, and when I read the books that's who I hear in my head. Monogatari takes a departure from the norm (bake and nise) to narrate the anime through the eyes of characters other then Araragi in 3 out of the 5 arcs. The three characters range from other main characters to side characters to even very unknowns such as the last arc's protagonist who is only in about 4-5 episodes of Nisemonogatari. All however are very compelling with differing personalities that put their own spins on the content. You finally get to understand some of the more peripheral ideas and concepts through the eyes of these characters which expands the universe as a whole. The animation style and quality is of course top shelf in keeping with the standards of other shaft works. Bakemonogatari had a limited budget when it was first done, but due to the increasing popularity of the series, more and more money has been allocated to the production of the franchise which really shows in each and every little detail. The animation also goes back to the more abstract and minimalist style of Bakemonogatari and sort of melds it together with some of the complexions of Nisemonogatari's scenery giving the series its own unique spin but also keeping things in familiar territory. Each arc has its own distinct feel and style which gives more life to content and makes it so that you could watch one arc as a stand alone and be satisfied. The writing is also very top shelf, with each arc weaving in and out from one another. In terms of time line, the progression of the show is far from linear; One arc being mostly narrated via flash backs which greatly compliments the content of it. As each arc comes to an end, more questions are raised and some get answered in the next or following arcs giving the sense that the plot is one continuous story despite having multiple points of view, timelines and frames of reference. Each "mystery" and question gives rise to various philosophical arguments which are explored through the dialogue of the characters as well as some of the different sequences. This gives the show a very layered feeling as one metaphor leads into another; in one instance, you may think the story is going one way only for it to make a complete 180 degree turn making things very rarely predictable. Overall, these added elements give the characters more emotional ties allowing for more emotional scenes then prior seasons. The plot also gains a sense of pure consistency as each new idea is introduced and the story steadily chugs along. The final few episodes take the series in a daring and unusual direction allowing for a final season to be added on but also giving this one a sense of finality. It is in essence a cherry on the top of a very well crafted piece of art/anime. New comers to the show may still dislike this style of story telling as it can be a little slow and high minded, but if you are to give it a chance, I guarantee you will not be sorry. While as a stand-alone series, Bakemonogatari holds a special place in my heart, Monogatari really shines as the most complete and best of the 3 (or 4 if you count Nekomonogatari) series, out doing the other 2 in almost every aspect from animation to plot and characters. SHAFT, Shinbou, and Nisio are back for another season of Monogatari! Not only are they keeping up with the same standards of beautiful animation and surreal imagery that made Bake and Nise such hit series, but the writing itself is really picking up and getting a LOT more interesting! At first it seemed as though they were gonna overhaul the fanservice like in Nise, but it seems as though they've dialed it down back to where it was in Bake, which is good if you ask me. I can definitely recommended this series to those who loved Bake and Nise! As a sequel to the Bakemonogatari and Nisemonogatari television series, this series has managed to capture the true essence of a timeless classic style of anime. Not only has this series been able to preserve the genuine artistic design and humorously intelligent dialogue from it's precursors, but it has materialized an impressive plot that is still congruent to the original story line. The characters have become very well developed, in fact, even more developed than from the previous series (if that is even possible). Every episode of this series has something to offer, not one is wasted on fillers. And most importantly, there is still that sense of mundane passion and authenticity in which the writers originally intended to portray. For fans of this series...you will not be disappointed. 5/5 stars. There's less fan service, the characters are still awesome, the OST is absolutely amazing, and the overall story is actually interesting. Animation: The art style hasn't changed. The quality has definitely went up somewhat but overall, you should expect the same amounts of neck bending, crazy angles, and eyeball shots. Of course they still do the thing where they show you a frame containing text for half a second. That might be the only thing that you find annoying. It's also worth noting that there isn't nearly as much fan service except for a certain scene towards the beginning. And yes, that is a good thing. Sound: The Monogatari series has always had a good soundtrack. That said, this season's soundtrack is way better than its predecessors' which says a LOT. From the OP and ED to the background music, everything fits the show perfectly. I cannot wait until the soundtrack becomes available in a CD because it's definitely worth listening to on its own, if you're into OSTs. Characters: I'll be brief. They're still great. The main difference is that we get a deeper look into their thoughts. Hanekawa and Sengoku in particular, are much more interesting than they were in previous seasons. I also have to give a big shout out to the narrator of the last six episodes, as this person is now my favorite character. Story: This time around, Mongatari has given it's story more impact. It's gone further than simple mystery and intrigue in the world of apparitions. The circumstances are more dire, the characters are more intertwined, and the plot delves deeper into character psychology. TLDR: If you watched the previous seasons, you won't be disappointed. It's better in every category. Watch the other 2 seasons first! I just finished all 3 of the Monogatari seasons. (Bakemonogatari, Nisemonogatari and Monogatari: Second Season). All of them were simply amazing. You might find yourself confused at times but if you carry on watching, your confusion will be cleared up in a later episode. A lot of text shows up and disappears too quick for you to read during each episode but they don't contribute to the plot so there's no need to stop and pause them. All in all, a great set of anime and a must watch. One of my favorite anime series of all time. In this day and age, many anime producers simply create a product. A product often lacking in the creativity department, and lacking in the character development department . However, "SHAFT" once again shows us their ability to create both a Product and a Masterpiece. The Monogatari series, in its entirety, can be considered a piece of art. However this piece of art may not be everyone cup a tea, It still deserves to be watched by everyone. Throughout my anime watching life, i have never once been so engrossed in the characters created. Monogatari does what others cannot, and create a beautiful episodic adventure in every episode without sacrificing beautiful character development in the process. The openings to monogatari are beautiful and unique, i myself; almost never watch openings and endings to anime's however, monogatari is the exception. I find myself in love with each and every opening and ending. The art style is gorgeous and iconic. The story is wonderful and the characters are top notch.